Areas outlined in red show locations of possible solar energy sites west of Tooele Valley. 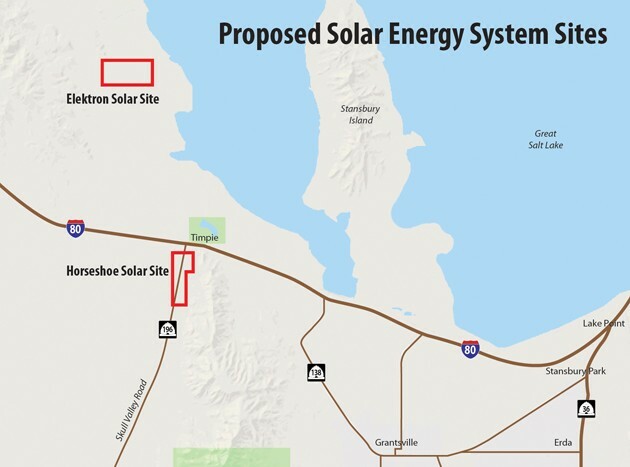 The Tooele County Redevelopment Agency has approved a preliminary step for the formation of two community reinvestment areas west of Tooele Valley that may become sites for large-scale solar energy system projects. 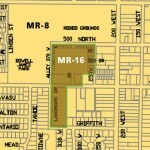 The County RDA, which is comprised of the Tooele County Commission, approved resolutions designating survey areas for the proposed Horseshoe and Elektron Community Reinvestment Project Areas during an Aug. 21 meeting at the County Building. “Both project areas are for solar energy systems to be developed by a third party contractor that develops green energy projects and sells the energy that is generated to tech companies that require a percentage of their power to be green-generated,” said County commissioner Shawn Milne, who is the chairman of the county RDA board. Community reinvestment areas are the latest public tax increment financing tool authorized in 2016 by the state Legislature. They replace redevelopment project areas. CRAs use real and personal property tax generated by growth from within a project area to finance redevelopment activities. The Elektron Community Reinvestment Project Area includes 549 acres of School and Institutional Trust Land Administration property north of U.S. Magnesium. The area is zoned for multiple-use and manufacturing-distribution. The M-D zone allows solar energy systems as a conditional use. The Horseshoe Community Reinvestment Project Area includes 1,706 acres south of Timpie, near Interstate 80 and Skull Valley Road. It also is on SITLA land and is zoned for manufacturing-distribution. The parent company of the limited liability companies proposing both projects is ENYO Renewable Energy, a Delaware-based company with offices in Sandy, Utah. ENYO has renewable energy projects in Utah and Wyoming, including the Spanish Fork Wind Farm. The resolutions approved at the Aug. 21 County RDA board meeting are the first step in the creation of two community reinvestment areas. The resolutions define the geographic area of the proposed CRAs and authorize the RDA and its staff to conduct a study to determine if the CRAs are feasible. The resolutions also authorize the preparation of CRA plans, including investigations, negotiations and other tasks, such as preparing a budget and contracting with consultants and government entities, for preparing a benefit analysis, public outreach, and developing interlocal agreements. If the solar system projects come to fruition, Milne said there is potential for the creation of some short-term initial jobs early on with construction and a few long-term jobs. The significant benefit to the county would be the property tax from the business personal property installed on the land. It’s too early to speculate the amount of revenue the two projects may generate for the county, Milne said. As SITLA land, the most property tax revenue the property currently brings to the county is the minimal property tax from some land that is designated as green belt and leased by SITLA for grazing, according to Milne. 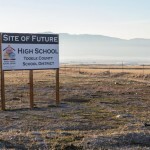 The beneficiaries of the potential property tax revenue would include Tooele County, the Tooele County School District, and the North Tooele Fire District. These are the three taxing entities in the proposed CRAs, Milne said. ENYO has inquired about potential economic incentives for locating the solar systems in Tooele County, but the county has not entered into any serious discussion about incentives at this time, Milne said. 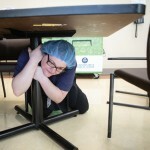 “First we have to determine if this is the highest and best use of the property,” Milne said.